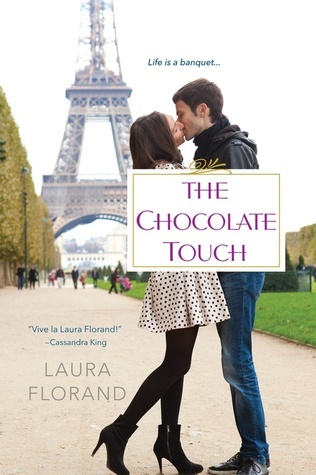 This is the fourth book in the Amour et Chocolat series by Laura Florand but it can be read as a standalone since every book tells the story of a different couple, though their all are interconnected/related. Ms Florand tells a romantic story for all the senses - sight, smell, hearing but mostly touch and taste. It tastes of dark chocolate - exotic, mysterious, addictive, love for life. The author's writing style is very engaging - descriptive and very sensual, taking the readers right to the very souls of the characters. The main characters, Dominique Richard and Jaime (I just love her name) Corey are both very well presented and I enjoyed them a lot. I might have even fallen for Dom, to be honest. I liked how they had he same feelings for each other, like mirrors - both of them felt unworthy of the attention and love of the other, they felt inferior and like they had nothing to give. At the same time, they both gave the other what was needed - strength and a sense of security for Jaime, acceptance and appreciation for who he is for Dom. Dom and Jaime's love blossomed at the romantic background of Paris and in the quaint world of luxury chocolate and pâtisseries. The story flow was nice and casual without too much drama and sudden twists. I was a bit annoyed with their lack of verbal communication at some point around the middle of the story. It was bound to lead to misunderstandings and complications but the strength of the their feelings helped clear them in no time. It was a very character driven story with strong emphasis on the relationships the main characters built with the people around them. Both Dom and Jaime had their inner (and outer) conflicts to overcome and they did it in order to be able to be together. I have two major objections preventing me from rating this book higher. First one refers to the use of French words and phrases. I do appreciate the authentic French falvour they give to Dom's character but I think they were slightly overdone. I know some French (I am not as fluent in it as in English), still I needed to check the meaning of some words and that took away from my overall enjoyment of the story. My other complaint has to with the ending and it is more of a matter of personal preference. Despite the happy-end, I would have appreciated an epilogue showing us Dom and Jaime further along in their relationship. Jaime Richard (I love Richard) does sound good and it would have been nice to see it happen in the book. Overall, I really enjoyed this love story and plan on checking out the rest of the series as soon as possible. I received a copy of this book by the publisher via NetGalley.